For many cruisers, escaping to quiet coves that can only be reached by boat is a real treat. Lunch on the hook or a week away—it’s up to you. But once you get there, you’ll need to know how to anchor your boat safely and securely. Use these expert tips so you can relax and enjoy the experience. There are only four steps to anchoring well, but first here’s a quick overview of the necessary equipment and terms. It isn’t the weight of the anchor that secures your boat to the bottom; it’s the way it digs in. Different types of anchors work best with different bottom types (mud, sand, weeds, rock), though most are designed to handle a range of conditions. 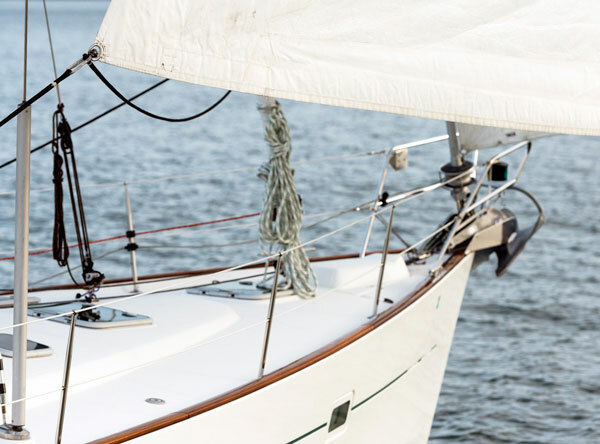 Check the manufacturer specs for the proper size to buy, and then measure your boat’s stowage space; owning a size larger than necessary might mean a better night’s sleep. “Rode” is what connects the anchor to your boat. Many boats use three-strand nylon line with a short piece of chain between line and anchor. Larger boats use all chain, which is more secure. It’s also hard to handle without a windlass, heavier to store, and harder to keep clean. And unless you want that chain jerking the boat around, you’ll want to add a short snub line as a shock absorber once the anchor is set. “Scope” is the ratio of rode length to water depth, and as a general rule more is better for holding power; picture pulling on a rode that’s parallel to the bottom (digging the anchor into the mud) vs. pulling straight up, and you’ll realize how important scope is. The usual restriction on scope is the available swinging room in an anchorage; the more rode you pay out, the bigger the circle of water you’ll “own” when the wind shifts. 4:1 is considered a minimum for chain, but how much you really need (or can get away with) will depend on many factors. Because you want to be able to let out enough scope to get that good night’s sleep, try not to anchor too close to other boats. It’s also considered rude to anchor directly upwind of anyone (though in crowded harbors, this may be unavoidable). And make sure the spot you choose has enough water depth for your boat, even at low tide. Don’t rush into anchoring; take your time and sniff out the best spot, especially if the harbor is new to you. Now that you have the right gear and a handle on the terminology, let's set that anchor. Before you toss your hook over the side, make sure the rode’s bitter end is firmly attached to the boat. And if you can’t easily hear what’s said on the bow from the cockpit and vice versa, figure out some basic hand signals that will indicate where the anchor is and what state it’s in (to port/starboard, on the bottom, halfway up/down, safely back on board). Once you’ve chosen your location, head into the wind and bring the boat to a complete stop. (Use the engine, or back your mainsail.) The goal is to drop the anchor when the boat has stopped moving forward, to keep the boat downwind of it. 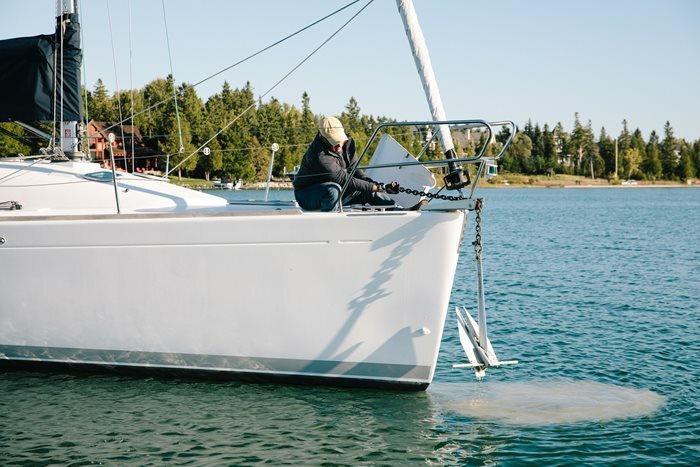 Depending on whether the anchor is stored on deck or on a bow roller, you will either have to toss the anchor over the side or ease it down into the water. Either way, make sure the rode will pay out cleanly, and try not to bang up topsides. Once the anchor is on the bottom, back the boat down and pay out just enough rode to keep from putting any strain on the anchor. If you pay out scope but don’t back down, the rode might drop on top of the anchor and create a snag. If you back down without paying out scope, the anchor will just drag along the bottom without digging in. Wait to take any strain on the rode until the angle is as horizontal as space and available rode allow. A traditional Danforth-type will set very happily with 7:1 scope (though this may not be realistic in many of today’s anchorages). Other anchor types will do fine with less scope, but none will object to more than necessary—especially when first settling in. line, or by engaging the windlass stop for chain). The rode should go taut as the anchor digs into the bottom. Cleat off the line, or (for chain) set up a snub line to run from the cleat out through the bow chock. In either case, keep watching the anchor and rode; it’s not quite time for cocktails yet. The next step is to dig the anchor into the bottom, so it’s really secure even if the wind shifts or tide and current pull the boat in a different direction. The goal is to create more of a strain than you are likely to get during the rest of your stay—so if the anchor is going to drag, it will do so while you’re paying attention. Use your engine (or a backed mainsail) to back down against the anchor line. If the tension on the anchor line increases, the anchor is holding. If the anchor is dragging, you’ll probably feel the anchor bouncing across the bottom and the boat will continue to move aft. If it doesn’t catch quickly, haul it up and try again. How hard you’ll want to dig it in depends on weather, how long you will be anchored (for lunch or for a week), how good the holding ground is, and how well-matched the anchor type is to the bottom. Once you’re secure, make sure to stay aboard for at least a half hour to watch for changes. And it’s a good idea to set up a visual range (or use your GPS anchor alarm) to alert you if the boat moves more than the scope allows. Hauling anchor isn’t as much fun as dropping it, partly because it means your quiet escape may be coming to an end. Use the engine/sails to crawl forward, collecting the slack in the rode as you go; that will be a lot easier than hauling the entire weight of the boat up to the anchor, hand over hand. And your windlass will last longer if you use the engine to move the boat forward, taking in the chain as it comes slack. Hopefully the anchor will pop out easily, once the rode is straight up and down and you’re pulling it up away from the bottom. If not, you may have to continue moving slowly forward until it pops free. Make sure to collect every bit of slack in the rode so it doesn’t get under the boat. You will probably either feel or see the anchor pop free; once it does, stop/slow the boat until you can get the anchor to the surface (or ideally, back on board). The goal is to prevent the anchor and rode from angling back under the hull, which might damage the keel, rudder, or prop. If the anchor and rode come up coated in mud, you’ll know you found good holding ground. Mud is much easier to remove when still wet, so don’t procrastinate; fire up the washdown if you have one, or use the old mop-and-dip approach. Knowing how to anchor your boat securely will earn you friends in an anchorage. It also makes one of cruising’s greatest pleasures possible: a good night’s sleep in a secluded cove. Good luck, and good cruising!